While you might have some knowledge of custom plastic extrusions, you may not realize how much they benefit a multitude of industries. For complex extruded shapes and tubing in rigid, co-extruded, and flexible plastic, you need to rely on one of the best custom plastic extrusion companies. As a result, you will end up with a finished product that surpasses your expectations. As part of the extrusion process, the company melts down raw plastic material, which it then forms into a pre-determined shape. For plastic products used by almost every industry, today’s custom plastic extrusions manufacturer remains in high demand. If you need plastic goods made for your business, consider three of the primary benefits of the extrusion process. High Rate of Production – Of the different advantages that come from custom extrusions, a high rate of production is perhaps the most notable. Because the top-rated custom plastic extrusion companies can produce a significant number of repeatable products with a fast turnaround, you have an excellent opportunity to grow your business. Whether your internal production processes increase or you receive a higher number of consumer orders, you need to do business with a manufacturing company that can create the plastic parts or components you need quickly. Cost Reduction – Although the best companies make plastic extrusions at extreme accuracy, this method is a great way to reduce costs. For one thing, even the highest quality plastic beads are inexpensive. Then, with this being an automated fabrication process, there is less labor involved, bringing the cost down further. 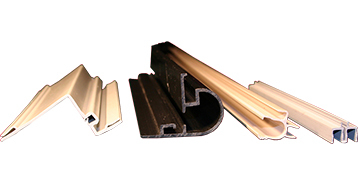 Versatility – Another benefit is that custom extrusions made of plastic are extremely versatile. By using different dies and plastic materials, a top manufacturer can accomplish almost anything. With so much versatility, a vast number of industries depend on plastic extrusions for a host of applications. Something else worth noting is that when you hire the right company to create plastic extruded parts or components, you can select from secondary operations, including holes, slots, notching, punching, and tape. That extends the opportunities that this fabrication process provides. While there is nothing wrong in choosing a standard extruded product, why would you want to when you get so much more from a customized solution. RPM Industries does more than make extruded products. We have a team that selects the highest quality of raw material available, which impacts the finished part or component. We also have a design review team that carefully inspects every customer order to ensure the extruded parts meet or exceed requirements. As a fully capable company, we want to make sure that every product made is precise. If you need plastic extrusions, we invite you to visit our website to learn more about our offerings or contact a company representative by phone.